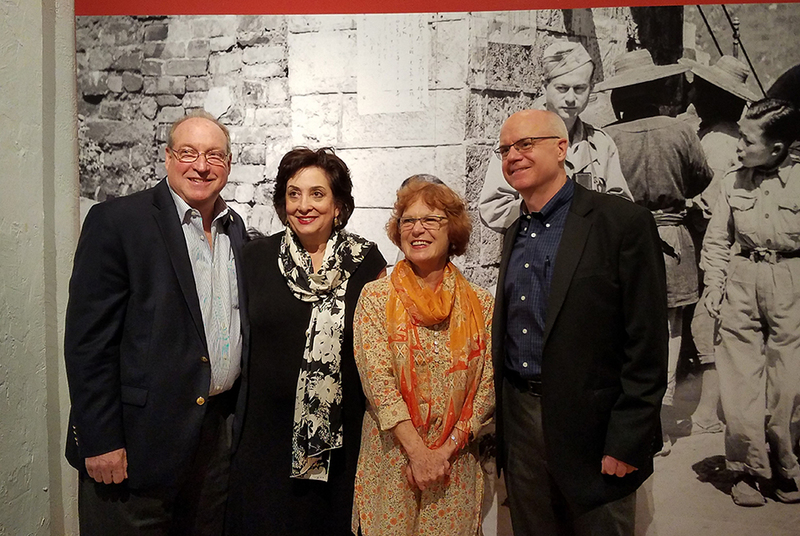 Ira D. Giller (Chair of the Museum Board), Susan Gladstone (Executive Director of the Jewish Museum of Florida-FIU), Ann Rothstein-Segan, and Brodie Hefner. MIAMI, FLA.- Miami’s leading arts lovers, patrons, artists, cultural and community leaders declared the Jewish Museum of Florida-FIU as the place to be this Season, at the U.S. premiere of Stranded in Shanghai: Arthur Rothstein’s Photographs of the Hongkew Ghetto, 1946, the timely exhibition featuring a lesson from history about tolerance, compassion for human suffering and solidarity. These themes ring true just as powerfully today during our troubled times as they did in the 1940s, when Shanghai became the last hope for desperate refugees fleeing Nazi terror. “The Jewish Museum of Florida-FIU is thrilled to present the U.S. premiere of Stranded in Shanghai,” said the museum’s Executive Director, Susan Gladstone. “We are honored to shine a light on this little-known segment of history that mirrors so much of our present. We must know history in order to proceed successfully with our future. Rothstein’s works are truthful and unflinching.” Miami Beach is the first city in the U.S. to present this exhibition, after showings in Prague and at Slovenia’s Festival of Tolerance. The museum is located in the heart of Miami Beach’s Art Deco District at 301 Washington Avenue in South Beach, and is part of Florida International University. At the opening reception, the photographer’s daughter, Ann Rothstein-Segan, PhD, presented an intimate portrait of her father’s life and illustrious career. She leads the Arthur Rothstein Legacy Project, and described to the museum goers at the reception some of the unusual circumstances that brought her father into this remote enclave of European Jews in China, revealing how his photographs of this community were lost for twenty-five years, only to be recovered with the help of an unlikely collaborator. There were 20,000 European Jews who escaped certain death by spending the war years in Japanese-occupied Shanghai, with nowhere else to go because they were turned away by so many other countries. Many of these refugees fled their homes in Europe under great duress without transit papers or money, and didn’t know what happened to loved ones left behind. Just like so many refugees and migrants facing similar issues today, they had no other place to escape to and surely would have died if not for this sanctuary in Shanghai. The photographs in this exhibition are some of the few remaining visual testimonies of the historic moment in time that this refugee crisis exposed. Throughout his career, Rothstein considered himself to be a photojournalist and a “social documentary photographer,” capturing images that explored issues of class, poverty, discrimination and economic opportunity. The photographer’s life, and his 50-year career as one of America’s most prominent photojournalists, offer multiple lessons to our present generations regarding displacement, migration, resettlement and tolerance. Rothstein’s photographs provide a window into the collective experience of the refugee community, and into the lives of individuals who had found a temporary home ̶ and tolerance ̶ in Shanghai. After the war ended, these stateless refugees became “displaced persons.” Most would survive the War, despite the severe conditions and deprivations of life in the Japanese-occupied port city. At war’s end in 1945 many were destitute and unable to return to Europe, facing an unwelcoming world where once again most countries would not welcome Jews. Even more terror was imminent: these 20,000 refugees would soon be forced to flee again due to the encroaching Civil War in China. Rothstein, one of the world’s foremost photojournalists, hoped his photographs would bring attention to their plight. On Sunday, March 18, at 5:00 p.m. the museum will present a film screening of Above the Drowning Sea, about these European Jews escaping the Nazis to Shanghai. Filmed in six countries and over seven continents, the film explores via personal interviews the intense experiences and life-long bonds shared between Jewish refugees and the Chinese residents of Shanghai, whose tolerance and support were critical in their survival. Rothstein’s photographs provide insight into the historical role of the photographer in the service of international organizations, and into the important role of photojournalism in zones of conflict and humanitarian conflict. This exhibition tells the stories and experiences of the refugees of the still mostly unknown Shanghai Ghetto – Jewish refugees from Austria, Germany, Poland, Czechoslovakia and Hungary who sought sanctuary in Shanghai at a time when, with rare exceptions, the entire world was refusing to accept Jews. Rothstein’s photographs include striking images: the haunting entrance gate to the ghetto, the crowded conditions of communal homes, a glimpse of what it was like to live in meager and unsanitary conditions with food and clothing rations as a lifeline, the lives of children and infants who were born into these conditions, the harsh severance of communication with Europe, and the challenge of searching for those left behind. Many European Jewish refugees arrived in Shanghai from late 1938 through 1940, due to the state-sanctioned violence that resulted in Kristallnacht (Crystal Night or Night of Broken Glass), a pogrom against Jews in Nazi Germany on November 9-10, 1938. Jews were systematically disposed of money and property and fled to Shanghai with few resources. In 1946, the UNRAA proposed to repatriate 1,700 Germans and 1,300 Austrians to their homelands, but only a few returned. Most refugees went on to find permanent homes in Israel, the U.S., Australia and other countries. Arthur Rothstein (1915-1985) was one of America’s premier photojournalists of the twentieth century. During his 50-year career, he created an indelible visual record of life and opened windows to the world for the American people during the golden era of magazine photography. He grew up in New York City, and as a student at Columbia University he founded the University Camera Club. He was hired early on as one of the first photographers to document and publicize the widespread displacement and migration of farmers and industrial workers, caused by the Great Depression. From 1935 through 1940, Rothstein and the other photographers working for the Farm Security Administration (FSA) Photo Unit shot some of the most significant photographs ever taken of rural and small-town America. One of Rothstein’s most well-known photographs is the iconic image of the Dust Bowl era, A Farmer and his Two Sons during a Dust Storm in Cimarron County, often included in high school history text books to illustrate the era. In 1940, Rothstein became a staff photographer for Look magazine, but soon left to join the U.S. Office of War Information. He served in the U.S. Army Signal Corp in Asia. After World War II, he took a limited assignment as chief photographer in China for the United Nations Relief and Rehabilitation Administration. Returning from China in 1946, he rejoined Look where he became Director of Photography until the magazine ceased publication in 1971. He went on to hold the same position at Parade magazine. Throughout his career, Rothstein served as a staff columnist for leading photography magazines and The New York Times. He was a faculty member at several universities and mentored a number of younger photographers including Stanley Kubrick, Charlotte Brooks, Doug Kirkland, Chester Higgins Jr, and John Shearer. Arthur published nine books on photography including textbooks on photojournalism and documentary photography. He was the recipient of more than 35 awards in photojournalism. His photographs are in the permanent collections of museums throughout the world. At the U.S. Library of Congress thousands of his images are freely and permanently accessible to the public. Editor & Publisher:Jose Villarreal – Consultant: Ignacio Villarreal Jr.